Now I’m not sure what the author means by asking the last question, for evolution in no way predicts that all animals will disappear from the Earth. I think the author was trying to ask the old creationist chestnut, “If humans evolved from monkeys, why are there still monkeys?”; but the person simply got it badly wrong. I’m not sure what you’re supposed to agree or disagree with. Is it the entire post? Or is it the non sequitur last statement? 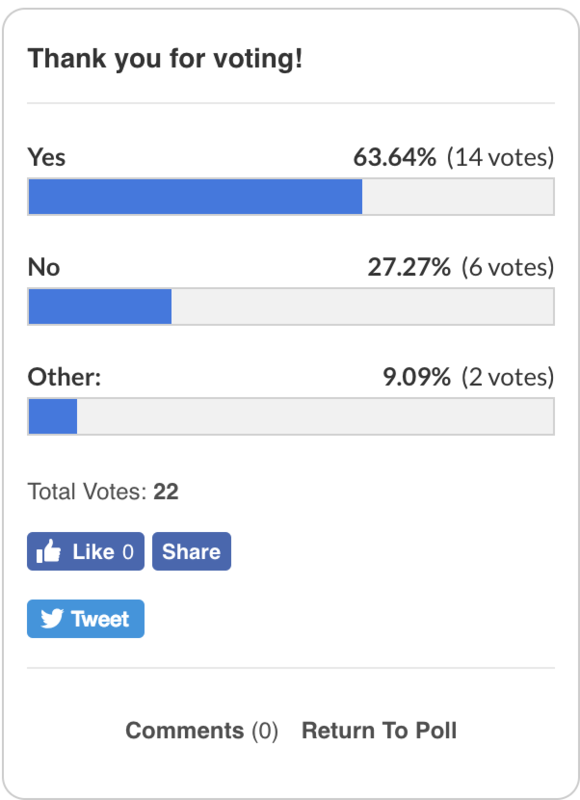 This is the outcome, for what it’s worth (I voted “no”, assuming we were asked to agree or disagree with this bizarre post). The author appears to be religious from the blog content, and there are 20 comments on the “evolution is a false escape” post, most of them involving the author and a commenter. I can’t be arsed to go through that crazy site, but ten to one the author voted for Trump. This entry was written by whyevolutionistrue and posted on August 2, 2018 at 9:32 am and filed under creationism, evolution-bashing. Bookmark the permalink. Follow any comments here with the RSS feed for this post. Both comments and trackbacks are currently closed. Your whole life has been wasted, Professor. What ever shall you do? Hah! I believe you’ve pharyngulated that poll as I just voted and it’s 16 agaunst and 14 for. … but I’m not sure that saying the ph-word is proper. Perhaps we should say it’s a WEIT-wash! We strive to be clean, we strive to be good, why? Because we know that in our hearts, we will eventually answer for what we have done. The people I regard as most moral are those who do good without fear or favour, in the honest expectation of no reward, because it’s the right thing to do. Relegating morality to some divine reckoning looks like the opposite of morality to me. Do good for goodness sake, not for one’s own sake. It’s a shining example of an individual who is stuck in the state of infancy/childhood that the Abrahamic religions produce, with their judgmental, punishing father figure in the sky. I wonder how many people put “yes” in the poll because they thought “well I do agree or disagree”. Looks like he was taking the “Why monkeys” argument to its inevitable, logical (!?!) conclusion. Have to hand it to a mind like that. With any luck, he spends too much time reasoning through issues like this to find time to vote. If I answer Yes then I either Agree, Disagree or both Agree and Disagree. If I answer No then I neither Agree or Disagree. If I answer Other then…um, I guess I could be in a superposition of agreeing and disagreeing? Or you need a paraconsistent logic? I learn something new on this site every day. The question gave me a serious case of the mind boggles, and I didn’t vote. Somewhere in the comments the guy says – I am not an expert on evolution, but. That could be a fine place to end. Certainly if you do not believe in it, why be an expert – kind of like not believing in a g*d.
If humans are the pinnacle of beings how can there still be a god? Or the reverse, if religion was correct and “gods” are the pinnacle of being, then why are there still humans? I see plenty of moral behavior in animals, sometimes even cross species. I also see lots of immoral behavior in humans but then, we were supposedly created in god’s image and anyone who’s read any holy book knows all gods are dicks. “Actually, the answer’s quite simple.” Two red eyes floated in the mist. Without humans gods could not play god. Take heart – the term “willful ignorance” has entered the political arena in TX in this excellent campaign spot. As an aside, I’ve followed your blog for years, read Faith vs Fact (twice! ), and am currently reading Why Evolution is True. You lay out the evidence for evolution exceptionally well. Any layperson who continues to deny the reality of evolution after reading your book lives in a world where conversation has ended because science has been dismissed. Thank you for being a beacon of rationality. His post seems like a cry for help. He’s contemplating future sins. If I was his neighbor, I’d lock my doors at night. At least there was an “other” box, so voting ludicrous was available to those of us who find yes/no somewhat inadequate in this context. evidently in response to PCCe. Obviously has no sense of irony since “intelligence” and even “syllables” are big words with more than two phoneme sounds to express meaning… nah, I’ll stick with syllables. The word God has one syllable. He thinks there is no need for more. Apparently… oh no, too many syllables. That undermines everything I say, yet again. Whether or not the writer of that idiotic article voted for Trump, Please do not think it works the other way — Trump voters are not necessarily creationists. I voted for Bernie and then Trump. I am an atheist and believe that evolution is as “true” as gravity. Didn’t like either Bernie or Trump. Voted that way to stop Hillary, whom I believed was a sociopathic warmonger and a long-time criminal, one of the most dangerous candidates in history. Would not want to see Pence in there, would you? Certified looney-tunes creationist. The Dems who are working to oust Trump should be careful what they wish for. Hilary was a poor choice for the Dems and she is one of the few on earth who could have lost to Trump, but a “long-time criminal”? jeeesh. She’s awfully hard to like and a rotten politician*, but a criminal? Normally I’d ask someone making such a claim to back it up, but there isn’t much worse than Hillary-derangement. *I know, I know; it’s redundant. A liberal atheist ought to be a good skeptic. You fell for a conspiracy hoax. You fell for a conservative conspiracy hoax. So you thought Hillary was worse than Donald? Did you entirely fail to do any due diligence into Donald Trump’s long history as a truthless, grifting reprobate? Did you fail to consider Trump’s utter unfitness — by experience, by intellect, by character, and (most crucially) by temperament — to be president of the United States? I’m no fan of Hillary’s, but any comparison isn’t even close. And do you still think President Trump was a great idea? Someone who is a benign and stable leader compared to the Clinton sociopathic war monger? If you answer ‘yes’, then I fear you are an inept judge of character. The fact that baboons survive well due to mutual altruism, and the obvious ingrained sense of fairness and justice in dogs and other pets has always impressed me. Belief in an indifferent universe could strengthen one’s sense of consequentialist ethics, even if it weakened one’s sense of other forms of teleological ethics. I guess people would still be able to fly, if that Christian alchemist Newton hadn’t invented gravity. Those who think someone has to invent nasty behaviour have a truly interesting world view, and I’m not joking here. It’s as if they thought angels have evolved into animals. I love that! Going to steal it if you don’t mind. This mother Orca’s carrying her dead baby for nine days so far may not be morality, but it is perceived by humans as love. And, now the pod is helping her. “Dumbest criticism of evolution ever” is a really high bar to meet. You have Ken Ham and the banana. And now you have Kent Hovind and broccoli. While certainly dumb, maybe not the dumbest ever. I get a twofer: slandering faith and the old witness canard. Let’s see if the response questioning the poster’s viewing of the resurrection gets through. I must stop this, it is a waste of life and I have no afterlife to look forward to. At least I wasn’t tempted to browse the rest of the site. God appears to be some sort of “judgement” fanatic. Get a life, God. Perhaps His devotees are frightened of being judged, and found wanting; they want us to be frightened, too. There’s probably no point in being a religious crank if you don’t make every effort to try and force other people to adopt your own weird beliefs. Scaring the impressionable makes them feel special or powerful, I’m sure. Even schizophrenics likely find it unbearable to be alone in their own private hell. My guess is that s/he supposes that humans would be the final goal of evolution, were it true, and that humans aren’t animals. I chose “other” and wrote “not even wrong” in honour of the great Pauli. I wonder if anyone there will recognise it. Yes! “not even wrong” and “he’s a legend in his own mind” are two of my favorite put-downs. If evolution is true then why is there still religion? Checkmate atheists! I think ‘…why are there still animals’ counts as being in the ‘not even wrong’ box. As for absconding from justice, in my opinion Protestantism’s rejection of good acts as a component of salvation and acceptance of sola fides is pretty much the poster child for that. We are all just hosts for viruses. The reason why there are still prokaryote and eukaryote cells is because viruses are under selection to not kill their hosts. At least not right away. I think he makes a good point. Why haven’t we all been eaten by triffids? When you live in a linear one dimensional world this is the kind of questions you ask. Dumb! indeed, is the answer. The views presented by that creationist are extremely common in the grassroots, and are the result of decades of doctrinal preaching (from Henry Morris in the 1970s down to Ken Ham and the still wackier Kent Hovind currently), that “evolution” is a nihilistic godless amoral package deal, dogs and cats living together. There are easily tens of millions of such people in the US today, and that number would reflect a big chunk of Donald Trump’s voter base, so make no mistake about the part such people play nationally in the real life of the Republic. Such people will not care a whit about the mutation rate of Alu retrotransposons in our genome, or the natural variation of pleurocells in the vertebrae of sauropod dinosaurs. Theirs is a Holy War “Kulturkampf” and no amount of science data will convince them otherwise. Really? I try, I really do, but I’m afraid laziness inhibits my more enthusiastic sinning. ^^^ As a hyena, I find this quite insulting. If evolution were correct, then why are there still animals on earth? Reading comments on the bottomlesscoffee007 website clearly shows that the author of that illogical mess is truly suffering from bottomless levels of willful ignorance. You cannot teach someone who is rabidly against education.